Individual blocks may be accessible to some users and not present to others. Individual pages may be accessible to some users and not present to others. The entire site can be access protected. See Blocking the Website. This page discusses controlling access on a block level. 1. Click the "Edit" button above the block you want to edit. 3. Click on the radio button next to the permission you want to select. 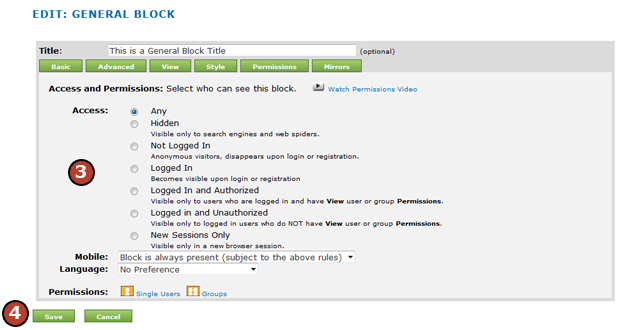 There are several levels of access and permissions you can set on your blocks. These settings are available on the Permissions Tab when editing the block. Click the "Edit" button above the block and then the Permissions tab to see the options and select these properties. Any – This options allows the block to be visible to anyone all the time. This is the default option for all blocks. Hidden – This options hides the block so that visitors or users at the site cannot view this content, only search engines. Not logged In – This options allows the block to be visible to users not yet logged in. This option is usually used for please log in messages for potential users. 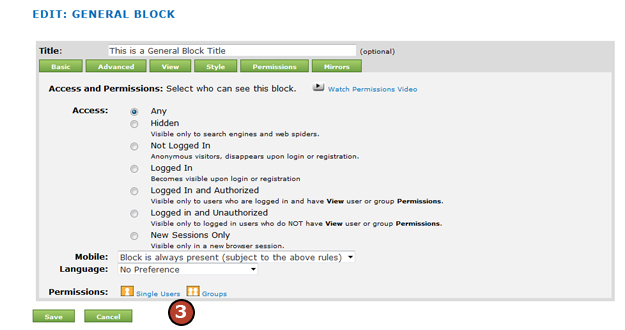 Logged In – This option allows the block to be visible to only those users who are logged in to the site. This option allows for content to be restricted to registered users. Logged In and Not Authorized – This option allows the block to be visible to anyone who is logged in but does not have permission to view the page. This permission is used for “need to purchase” messages. New Sessions Only – This option restricts the viewing of the block to only be visible in new browsing sessions by a visitor or user. Mobile – This option allows the block to be visible or not visible on mobile devices. In addition to view permissions, users and groups can have more specialized permissions to blocks on a site that include adding to the site, or editing blocks where permission is granted. The set of available permissions depends on the block type. For example, articles and bulletin board blocks have permissions for article creation and deletion, but text blocks do not need these permissions. The more complex the block's operations, the more complex the block's permissions. When a user has "Manage" or "Administrate" permission on a page, that user has all permissions to all blocks whose original content is on that page. 1. Click the "Edit" button above the block you want to add a user or group permission. 3. Click either "Single Users" or "Groups" at the bottom of the Permission screen to access the permission screen for either individual users or groups. 4. Click in the check box below the permission you want to assign to the user or group. 5. Click on the "Save Permission" button. 6. Click on the "Save" button back on the Permissions screen.